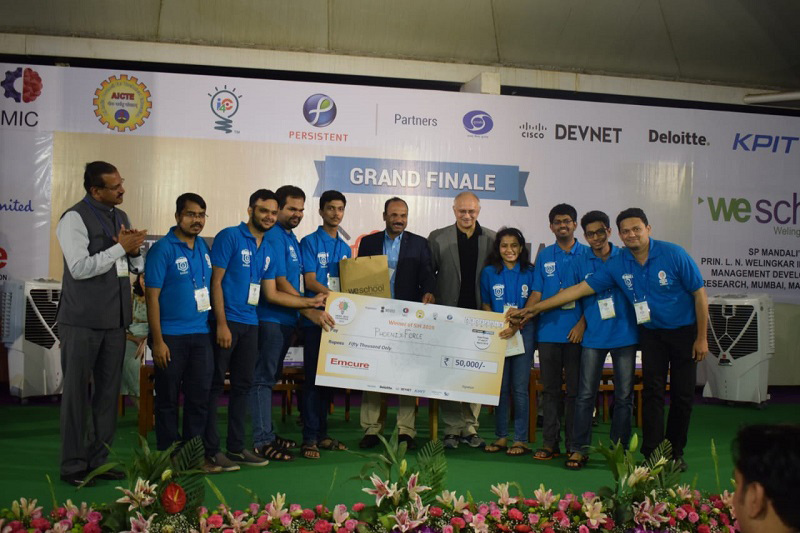 Over 180 students and mentors from across Maharashtra, Punjab, Madhya Pradesh, Tamil Nadu, Delhi, Karnataka, Gujarat, Andhra Pradesh and Telangana competed to design tech solutions in the 36 hour non-stop Smart India Hackathon 2019 at S.P. Mandali’s Prin L. N. Welingkar Institute of Management Development and Research (WeSchool), Mumbai’s only nodal centre. Participants from various Institutes in Delhi, Punjab, Tamil Nadu and Maharashtra won trophies and prize money of Rs 50,000 to Rs 1,00,000. Boosting student morale were WeSchool Inspiration Awards awarded to seven teams from Haryana, Punjab, Maharashtra and Telangana. For Smart India Hackathon 2019, some of the themes for problem statements are Smart Communications, Healthcare & Biomedical devices, Agriculture & Rural Development, Robotics and Drones, Waste management etc. Smart India Hackathon engages around one lakh technical students, 3,000 technical institutions and over 200 organisations across India. Prakash Javadekar, minister, Ministry of Human Resource Development, officially announced the opening of the Smart India Hackathon 2019 in an inaugural video speech in Delhi, along with Prof. Anil Sahasrabudhe, chairman, All India Council for Technical Education (AICTE) and Dr. Anand Deshpande, chairman & MD, Persistent Systems and co-chair, Organising Committee, Smart India Hackathon 2019. WeSchool is the only B-School in Maharashtra to be associated with Smart India Hackathon 2019. The institute is hosting the Smart India Hackathon – Software Edition, grand finale, for the third year in a row. Smart India Hackathon is a nationwide initiative to provide students a platform to solve some of pressing problems we face in our daily lives, and thus inculcate a culture of product innovation and a mind-set of problem solving. Smart India Hackathon 2019 is an initiative of the Ministry of HRD, AICTE, Persistent Systems, i4c and Rambhau Mhalgi Prabodhini. For more information visit, https://www.sih.gov.in/sih2019. Ranked among India’s top business schools, WeSchool is a pioneering management education institution with emphasis on design-led innovative management education for shaping vision and mission of global citizen leadership.